Tobacco use is the #1 leading preventable cause of disease and death in the United States. In Mississippi alone, 4,700 adults die each year from smoking, and 192,000 children are exposed to secondhand smoke at home. 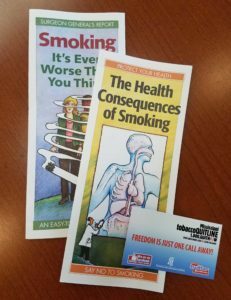 The Mississippi Academy of Family Physicians Foundation (MAFPF) and the Mississippi Department of Health, Office of Tobacco Control (OTC) partner to engage family physicians by training the staff at family physician clinics on how to “Ask, Advise, and Refer” tobacco users to appropriate treatment. In addition, we engage family medicine residents by training them on the “2 A’s and an R” and educating them on both emerging tobacco products and mental health considerations in tobacco use and intervention. Program funding and support is provided by OTC. Tobacco-Free Lunch and Learns: MAFPF will provide a free one-hour Lunch and Learn training session to MAFP members. We will bring lunch and educational materials you can distribute to your patients. In addition, you will learn how to simply refer smokers to the state’s tobacco quitline and basics about trending tobacco products and cessation therapies. Contact Jewell Buckley for more information or to schedule a Lunch and Learn. ‘Two A’s and an R’ Program: Physicians are encouraged to (A) Ask: Ask about tobacco use and smoke exposure at every visit (research shows that just asking can double attempts to quit smoking); (A) Advise: Strongly advise every user to quit and personalize the health risks to the tobacco user; (R) Refer: Refer tobacco users to the state’s Tobacco Quitline: 1-800-QUIT-NOW. Free nicotine replacement therapy,medications, counseling and support services can be provided to Mississippi’s residents. The AAFP sponsors Tar Wars and MAFP serves as the state coordinator for the program.